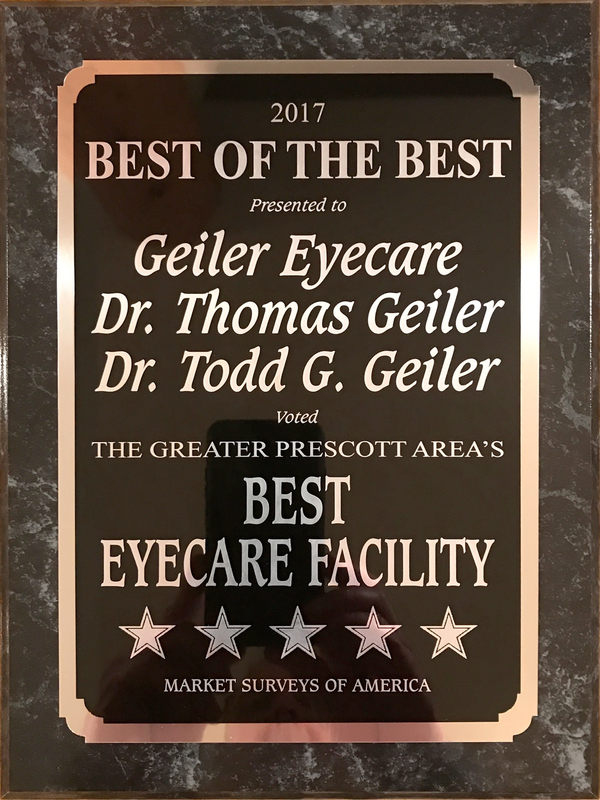 Geiler EyeCare recently awarded BEST EYECARE FACILITY for 2017, located in Prescott, Arizona, we provide eye care examinations diagnosing refractive and binocular conditions of the eye such as near sightedness, far sightedness, astigmatism, muscle imbalances and neuro-ophthalmological assessments. Contact lenses are fitted and their proper care taught to each patient. In addition, we provide dilated eye examinations for extended views of the retina, the tissue in the back of the eye. These views are required for the proper diagnosis of wet or dry Age-Related Macular Degeneration, retinal detachments, cataract evaluation and vitreous degeneration/disease resulting in floaters and flashes as well as tears in the peripheral retina. We diagnose and treat glaucoma as well. In April 1946, Dr. Lenard Geiler began a legacy spanning three generations known today as Geiler EyeCare here in Prescott, Arizona. Our original office was located at 225 West Gurley Street. After a number of years in that location, the office was moved to Summit Street until 1976 upon which it was moved to our present location, 1000 Willow Creek Road, Suite J. This legacy began with a commitment to you, the patient. Geiler EyeCare is in its third generation providing complete eye care throughout Central Arizona including the City of Prescott and the surrounding Tri-Cities and Quad-Cities. Adhering to the highest standards of quality and a firm commitment to our patients, our goal is to educate each patient and implement a treatment plan individualized to you. From refractive conditions of the eye to the diagnosis of ocular disease, we have the experience and depth to provide you the comfort and knowledge knowing you will be cared for. Treating vision disorders and diagnosing ocular diseases in all age groups, Geiler EyeCare provides comprehensive state-of-the-art equipment with a sub-specialty team approach. Dr. Todd Geiler, his father, Dr. Thomas Geiler and his Grandfather, Dr. Lenard Geiler, are Prescott natives and have provided eye care for more than 67 years. A family steeped in Yavapai County with an eye on Prescott’s medical history, we remember the good old days but utilized the advancements of current medical technology in their application to your care. Geiler EyeCare is located in Prescott at 1000 Willow Creek Road, Suite J, across from Yavapai Medical Center in Prescott, AZ.